Lugol’s taken internally in addition to replenishing the thyroid, also brings amazing relief and a calming, soothing, peaceful state to anxiety and a manic stage. It destroys vicious stomach bacteria, (especially salmonella), against gas, bloating, indigestion, heartburn. Doomed are harmful bacteria and parasite eggs. It is 100% safe (except if allergic) to take regularly, but only use as needed. 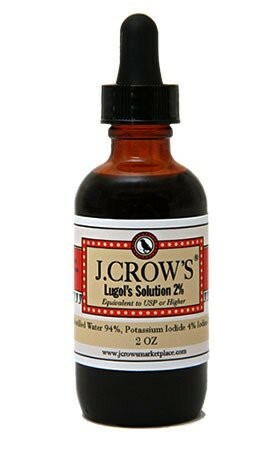 Lugol’s iodine is old-fashioned iodine and years ago was used for treating various illnesses. It has a distinctive trait – it hangs up on everything. In the stomach, it attaches to vicious salmonella, bacteria, parasite eggs and they are doomed. The thyroid is the organ most capable of absorbing iodine. Pathogenic microorganisms, the primary cause of disease, are made weaker and most are killed as they pass through the thyroid, provided, it has its normal supply of iodine. Clinical studies show that very few people have enough iodine in their thyroid to function optimally. This deficiency has occurred in the 20th century because of chlorine in drinking water, the alteration of natural food sources and modern farming practices. Aggravating the problem is that the body does not conserve iodine, therefore, we must get a regular supplemental intake to maintain optimal health. The Thyroid, Iodine and Disease Prevention The role of the thyroid gland has been understood for some time now. Although conventional medicine places emphasis on its contribution to regulating the body’s metabolism, and equally important role is its contribution to the immunological health and body. You would get 3.125 mg of iodine out of a vertical drop and 6.25 mg out of a horizontal drop. In a 2 oz. bottle you would get roughly 250 drops. The solution will go right to the bloodstream by passing the digestion process also liquid is more controlled and you can get more uses out of it. You can apply it to the skin or take it orally.